Imagine how much more fun ministry would be if your church members saw their work as ministry. With all of these business folks ministering on the job daily, their confidence in faith-sharing and ministry would soar. With intentional ministry, their customers and friends would know more about your church, its ministries, and perhaps, even worship with you. Your church would be intentionally focused on missional ministry. This book is an excellent peer learning group resource or a wonderful training experience for a small group in your church. Dr. Joey and Mike use real life situations, humor, and scripture to deepen confidence in sharing and ministry. Discover the 7 Weeks to Faith Positive Coaching Program for Churches to develop a small group ministry of lay people by clicking here. 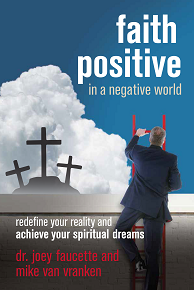 Check out a podcast interview with Dr. Joey about Faith Positive here. Every member a minister! We do a lot of talk about this. Here is a resource that helps you give your members a tool for ministering more effectively in their work places. As you gear up for the days into the new year, this is a wonderful time for some training, small group work, and peer learning. Bo Prosser serves as Coordinator of Organizational Relationships for the Cooperative Baptist Fellowship.